You probably don’t give too much thought to your thermostat. You set it to one temperature for the summer, and one temperature for the winter, and don’t look at it much in between. Or perhaps you do think about it a lot, and you are constantly adjusting the temperature based on the time of day or the outside weather. Whichever category you fall into, a programmable thermostat would be a major benefit to your residential heating and air system. A programmable thermostat allows you to preset your home’s temperature for certain times of the day. You can tell it to adjust the temperature at night when you go to bed and adjust it again right before you get up. You can tell it what to do during a certain date range when you may be gone from home. And some can even connect to your smartphone so that you can program your thermostat remotely. What are the benefits of this device? Save money. 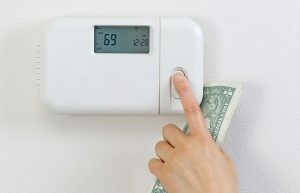 Perhaps the biggest benefit of the programmable thermostat is the money you save. Your energy bill will go down because you are maximizing the energy your HVAC system uses to keep your home at the desired temperature. Changing the temperature at night and when you are out of the home can make a big difference in overall energy use. Enjoy peace of mind. Once you have programmed your thermostat, you can forget about it. No need to constantly adjust the temperature to suit the time of day. And when you are going to be out of town, your thermostat will know what to do. If you forget to program it before you leave, you can use your smartphone to set it. It’s a stress-free way to manage your home comfort system. Extend the lifespan of your HVAC system. A programmable thermostat takes some of the stress off of your system. Reducing the amount of time your heating and cooling system runs and the amount of cycling on and off will allow it to last longer. You may get many more good years out of your equipment. Feel more comfortable. You can expect to feel more comfortable in your home because you can program the temperature to suit the time of day and your plans. At night you may prefer a cooler temperature since you’ll be under the covers, but you may want it to be warmer once you are up. You can program your thermostat to raise the temperature just before you get up so that you don’t have to roll out of bed in the cold. You can also set different zones in your home to be warmer or cooler so that you’re keeping the most used parts of your home at the optimal comfort level. Save money and relax in comfort after you call Berico to install your new programmable thermostat. Your technician will help you to program it to suit your lifestyle and provide you with the knowledge to adjust it as you see fit. It can work with any HVAC system, so contact Berico to schedule your installation today: (336) 273-8663.